Home / QuiBidder of the Week – Jayson V.
Congratulations to our brand-new QuiBidder of the Week, Jayson V.! Jayson has been bidding on QuiBids for a bout a month now, and has already scored an awesome haul of some great wins. Keep reading to see what Jason has won on QuiBids in just under a month. Do you want to be the next QuiBidder of the Week and win a $50 gift card of your choice? Click here to submit your responses along with a photo of you with your wins. 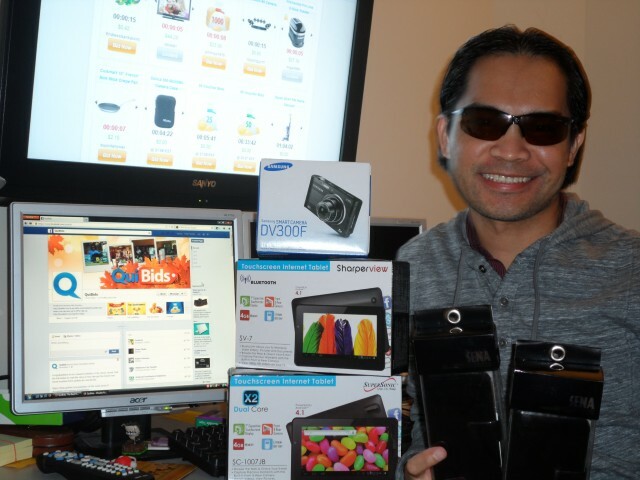 Thanks again Jayson for sharing your QuiBids Story with us! Be sure to congratulate him on his wins in the comments below. Click HERE to see what’s up for auction on QuiBids right now.